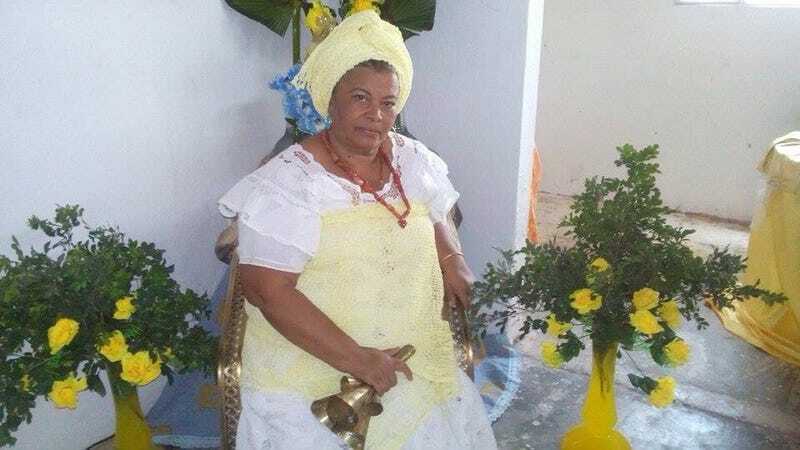 Candomblé priestess Carmen Flores was leaving her house three months ago when seven armed men confronted her. They demanded that she destroy the sacred contents of her house, a spiritual home for more than 125 followers of the Candomblé Afro-Brazilian religion. “Since my orisha is Oxum, our house was all about love,” said Flores, 66, who is better known as Mãe de Santo Carmen de Oxum. Oxum is the orisha of love, commonly represented as a woman dressed in yellow and holding a mirror. Fearing for her life, Flores followed their directions while they yelled expletives at her. “Burn everything! Break everything! The blood of Jesus has power!” they yelled. She destroyed porcelain bowls that she and her followers used during special ceremonies. She knocked over images of the orishas that guided her and her followers. She knocked over clay jugs used to store water for special ceremonies. The perpetrators of this violent form of religious intolerance were evangelical drug traffickers who claim that they are ridding their communities of evil by destroying Candomblé and Macumba centers. These men recorded Flores destroying her center and proudly shared it on social media and messaging apps. The video went viral. Candomblé is an Afro-Brazilian religion that has roots in the Yoruba, Fon and Bantu beliefs brought to Brazil by enslaved Africans. Throughout Brazil’s 400-year history, Afro-Brazilian religions like Candomblé have survived the ebb and flow of religious intolerance. But its latest form, in which local drug traffickers are destroying the religious centers of local residents in their own communities, is so violent that it’s being called religious terrorism. In the last three months, more than 30 Candomblé and Macumba religious centers have been destroyed in Baixada Fluminense, a poor, majority-black suburban area of Rio de Janeiro. Vanessa Andrade, a psychologist and Candomblé follower, counsels victims of religious intolerance to not leave their faith and helps them to understand that they are not the reason for the violence. From the moment the Portuguese landed in Rio in the 16th century, they insisted that everyone, including the indigenous, become Catholic. Enslaved Africans hid their religion, often syncretizing Catholic saints with Candomblé orishas. After emancipation, the Candomblé terreiro became one of the main meeting places for the expression of Afro-Brazilian religion music and culture, much like the church did in African-American culture. Today, the increased religious persecution of Afro-Brazilian religions correlates with the rise of evangelical Christianity in Brazil. During the ’80s and ’90s, Afro-Brazilian religions enjoyed a relatively calm period spurred on by guaranteed religious rights in the new Brazilian constitution. But a new Pentecostal and neo-Pentecostal religious movement was brimming in Brazil, and in Rio, it targeted favelas and the suburbs—poor, black areas that had long been ignored by the government. Andrade advises people to pursue their rights by denouncing the act of religious tolerance. But this is difficult for victims of religious intolerance by drug traffickers because the victims usually live in the same neighborhoods as the attackers. “Calling the police in these neighborhoods is out of the question as it will likely result in death,” she said. After the incident, Flores fled to Europe, where she remains today. Flores’ terreiro was located in Nova Iguaçu, one of the 13 municipalities that border Rio de Janeiro to the north—the Baixada Fluminense. Its mostly black and poor residents commute an hour or more to work in the city because they can’t afford Rio’s housing. Tourists rarely venture out to these suburbs, where Rio de Janeiro’s problems are amplified. The poverty is deeper. The violence is worse. It’s a forgotten area. “The Baixada Fluminense is often stigmatized as a culturally and historically devoid no-man’s land,” said Stephanie Reist, a researcher who has spent the last three years studying the area’s political, social and economic movements. But according to Reist, that couldn’t be further from the truth. The area has the largest concentration of Candomblé worship houses in the state of Rio de Janeiro. A 2014 map counted 274 Candomblé and Umbanda (another Afro-Brazilian religion) houses in the Baixada. Throughout the 20th century, the area’s cheap housing attracted black immigrants from the northeast, who brought their African religion with them. Many terreiros moved to the Baixada from the city of Rio de Janeiro in search of space for their religious activities. Now this area is ground zero for religious intolerance within Brazil. Within a one-month period last fall, at least eight Afro-Brazilian houses of religion were attacked in the Baixada Fluminense. In 2017, the state of Rio de Janeiro has already recorded 79 attacks against Candomblé houses of Afro-Brazilian religions; 39 between July and September. Last year, Brazil recorded 776 cases of religious intolerance, an increase of 36.5 percent from 2015. The presence of evangelical drug traffickers in Rio de Janeiro’s poorest neighborhoods and suburbs is not new. Researcher Christina Vital has been studying evangelism in Rio’s favelas and suburbs for the last two decades. Twenty years ago, drug traffickers were often followers of Candomblé, but today, they are mainly evangelical, having grown up in evangelical families. “They have been going on since 2008. But now there is greater visibility,” said Vital, who is a professor at the Fluminense Federal University. Vital also says that the recent violence against terreiros is a new way for drug fractions like the Third Command to stake a claim on a physical region. Flores says her particular area of Ambaí in Nova Iguaçu didn’t have drug-trafficking gangs until just over five months ago, when they invaded the community. Another difference is that drug traffickers return to their communities from prisons as fervent adherents of Pentecostal and neo-Pentecostal Christianity. But this isn’t necessarily by choice. Within prison, the best form of self-protection is to join an evangelical cell. It’s not uncommon for prison inmates to divide themselves into cells based on religion, and the evangelical cells are some of the largest. But there’s a small group of fanatical pastors who are using their presence in prisons to promote intolerance and religious hate. “These young men are returning from prison brainwashed and with so much hate,” said Flávia Pinto, the coordinator of religious diversity for the city of Rio de Janeiro and a follower of Umbanda. Pinto likened these young men to the Islamic State group, or ISIS, fighters in the Middle East who use religion as an excuse for violence. Shortly after the video of Flores being forced to destroy her Candomblé terreiro went viral, Rio de Janeiro held a Walk for Religious Freedom. The walk, now in its 10th year, attracted more than 3,000 people of various faiths who walked along Copacabana Beach to bring awareness to religious intolerance and religious freedom. A similar walk was held in Rio de Janeiro’s suburbs for the first time last week. But Pinto admits that the fight against religious tolerance won’t be easy in light of the growing evangelical influence in Brazil’s national, state and city governments. “There are few politicians taking on the theme of religious intolerance,” said Pinto, who educates city workers on religious intolerance in her role as the Rio de Janeiro coordinator of religious freedom. Despite this, Pinto feels that the greatest achievement of this movement against religious intolerance is the increased visibility. Pinto has been fighting against religious intolerance for the last 20 years, and she says the visibility of the issue today has never been greater. Flores is also pleased with the visibility. While she recuperates in Europe, she has already secured land to rebuild her Candomblé terreiro in Brazil. “I’m coming back,” she said.